Staten Island is New York City's "Forgotten Borough" across New York Harbor from Manhattan. Staten Island may seem like it's in an entirely different world than the hustle and bustle expected in New York City. However, it still has some of the features you've come to expect from the city. This combination of city influences and its rural origins have created a unique borough that is a great place to visit. The locations of Staten Island's three main regions, within New York City. Staten Island has numerous neighborhoods, each with a distinct feel and different attractions. These neighborhoods can be grouped into three regions: North Shore, Mid-Island, and South Shore. The North Shore includes the area north of the Staten Island Expressway. The South Shore generally includes the area south of the Fresh Kills. The Mid-Island takes up the area in-between. St. George – St. George is the political center of the Island, the location of its Borough Hall and County Courthouse. It is also a transportation hub, with the St. George Ferry Terminal, and a cultural center, with many attractions. These include the Staten Island Museum, the Postcards September 11 memorial, and the St. George Theater. Tompkinsville – A number of ethnic restaurants can be found here in Staten Island's "Little Sri Lanka". Stapleton – This small waterfront neighborhood is known for just that: its waterfront. Sometimes known as the Stapleton Homeport, this stretch of water almost became a Unites States Navy base, a plan that ended due to lack of funding. Today it is mostly residential housing; however, it is still used as part of the annual New York City Fleet Week. Clifton – A section of this neighborhood is called Little Liberia. It is home to the largest Liberian population in the world outside of Liberia. New Brighton – This small neighborhood just to the west of St. George can be characterized through its main attraction–the Snug Harbor Cultural Center. Once a retirement home, Snug Harbor is now a collection of museums that showcase the best of Staten Island's culture. West New Brighton – This neighborhood is a separate entity from New Brighton. It is home to the Staten Island Zoo. Port Richmond – One of Staten Island's oldest neighborhoods, Port Richmond is home to many examples of beautiful architecture. Mariners Harbor – This neighborhood began as a fishing village, and is now a minor center for shopping. Silver Lake – This neighborhood is dominated by the lake and park of the same name. A popular place with the locals, Silver Lake is the largest body of water on Staten Island. Grymes Hill – Grymes Hill is home to a number of colleges, including Wagner College and St. John's University Staten Island Campus. Willowbrook – This large neighborhood has a peaceful vibe to it. It is home to Willowbrook Park and the College of Staten Island. Old Town – True to its name, Old Town was the first European settlement on Staten Island. The Dutch called it Oude Dorpe. Todt Hill – The peak that shares the same name as the neighborhood is considered the highest point on the Eastern Seaboard. Todt Hill has many rich residents, who love to overdecorate their lawns, much to the amusement of other Islanders. These two factors contribute to the area's majestic feel. Dongan Hills – This large neighborhood is very peaceful. A section which borders Todt Hill is called the Dongan Hills Colony. It is home to large mansions, and offers a unique view of the Manhattan skyline. South Beach – Formerly home to a bustling amusement park, South Beach has quieted down a lot from its glory days as a summer getaway. Now, the area is mostly residential, with large Polish and Russian populations. The popular beach of the same name is still open. New Dorp on the Staten Island Railway. New Dorp – New Dorp has deep roots in history, spanning back to the American Revolution, when it was the base of the British army in New York. Now, the neighborhood is one of the area's major commercial centers. Its main thoroughfare, New Dorp Lane, is home to any type of store you could wish for–from a convenience store, to a fancy cake shop, to mom-and-pop shops, pizzerias, and a karate school. Richmondtown – Richmondtown is home to Historic Richmond Town, a collection of buildings dating back as far as the 18th century. New Dorp Beach/Oakwood Beach – These two waterfront neighborhoods were hit hard by Hurricane Sandy. Heartland Village – The commercial center of the entire island is home to the Staten Island Mall and a number of other large and small shopping centers. Chelsea and Travis – Two tiny, mostly industrial neighborhoods on the western edge of the island. Great Kills – The northernmost neighborhood on the South Shore is very residential and has a large park and marina. Eltingville – This humongous neighborhood is also primarily residential, but is home to a major transit center. Huguenot – Huguenot is named after the French Huguenots, its original settlers. Nowadays, the very suburban neighborhood is home to many other ethnicities as well. Rossville – Formerly farmland, Rossville has developed greatly. Sandy Ground – Sandy Ground (no connection to Hurricane Sandy) has great historical importance. It was the first community for freed slaves established in North America. It dates back to 1827, when slavery was abolished in New York State. Charleston – A very remote neighborhood, it is home to a sizable commercial sector. Tottenville – Tottenville is the southernmost point in New York. It developed earlier than the rest of the South Shore, thanks to its prominence as a transportation hub before the invention of automobiles. Many examples of nineteenth-century architecture can be found here. Staten Island is a borough of about 500,000 people. While that's not even half of the population of any of the other boroughs, it's still respectable for a U.S. city. Staten Island is in New York Harbor, and is the southernmost point in New York State. It's practically in New Jersey. Staten Island is New York City's only borough that lacks a predominant numbered street grid -- you can not depend on the numbers of the streets to tell you where you are. Staten Island has four main highways: the Staten Island Expressway (I-278), the West Shore Expressway (NY-440), the Martin Luther King Jr. Expressway (also NY-440), and the Korean War Veterans Parkway (unofficially known as the Richmond Parkway). The Staten Island Expressway runs east-west, from the Verrazano-Narrows Bridge to the Goethals Bridge. The West Shore expressway runs south from the Staten Island Expressway in the northwest portion of the island to the Outerbridge Crossing in Tottenville. The Martin Luther King Jr. Expressway runs north from just east of the SIE's junction with the West Shore to the Bayonne Bridge. The Korean War Veterans Expressway branches off from the West Shore Expressway just north of the Outerbridge and runs northeast all the way to Eltingville. Compared to the neatly-organized grid of Manhattan, the layout of Staten Island's streets may seem like a child's drawings. On the contrary, most streets run in a simple pattern. The biggest streets run east-west (parallel to the northern shore), north-south (parallel to the western shore), and northeast-southwest (parallel to the eastern and southern shores). This creates the effect of a triangle. If you know the main roads that form each side of the triangle, you won't get lost. Staten Island can be reached by passenger ferry from Manhattan. The ferry is the most visually pleasing option for arriving on the island, as it passes by Liberty Island and offers stunning views of the Manhattan skyline and New York Harbor. The ferry is free and operates 24 hours a day out of Battery Park in Manhattan and St. George Terminal in Staten Island; even during the early morning hours, it never runs less than once every half hour at the half hour. You can see a current schedule on this page. The 25-minute ferry ride is also sometimes a faster trip from Lower Manhattan to Staten Island than a corresponding trip by car or bus. The ferry allows bicycles on the lower decks, where there are usually bike racks. The St. George Ferry Terminal is also a terminal for the Staten Island Railway and many of Staten Island's local buses. Staten Island can be reached by bridge from Brooklyn and New Jersey. Verrazano-Narrows Bridge connects Staten Island with Brooklyn, but you will incur a high toll of $11.52 with a New York E-Z Pass users or $17.00 for out-of-state E-Z Pass users and non-E-Z Pass users (westbound to Staten Island only; no toll eastbound). Bayonne Bridge connects northern Staten Island with Bayonne, New Jersey. Goethals Bridge connects Elizabeth, New Jersey to mid-western Staten Island. Outerbridge Crossing connects Perth Amboy, New Jersey and Tottenville, Staten Island. These last 3 bridges have a $15.00 ($10.50 on Off-Peak times and $12.50 on Peak-times for E-ZPass issued by New York or New Jersey) toll payable only when entering Staten Island, not leaving it. The carpool toll is $6.25 with 3 or more people in a car, payable only with E-Z Pass. The Bayonne Bridge and Verrazano-Narrows Bridge use an All-Electronic Tolling System, meaning that no cash payments are allowed, and without E-Z Pass, your toll will be paid via Tolls-By-Mail. A moderately priced option is to take an express bus from Manhattan to Staten Island. The express buses are especially handy when you are traveling to places on the South Shore, which is the furthest section of Staten Island from the ferry, and has fewer local routes running than the more densely populated North Shore. The $6.50 fare is payable with MetroCard (pay-per-ride only), Express Bus Plus MetroCards or coin change. Dollar bills are not accepted. Most express buses run solely on weekdays. The X1, X10, and X17 run 7 days a week. The X1 runs 24/7. The wait times for an express bus are about 4–10 minutes during rush hours, 15–30 minutes other times. The Staten Island bus map (service descriptions) covers the routes on the island. There is also the option of taking the S53, S79, or S93 buses from the 86th Street subway station of the R train in Brooklyn. These bus routes cross the Verrazano-Narrows Bridge into Staten Island. Since these are considered local bus routes, you can pay for the ride by depositing $2.50 in coins in the farebox or swiping your MetroCard. The S79 serves the Mid-Island region and the South Shore. It goes along Hylan Boulevard and Richmond Avenue to get to the Staten Island Mall. The S93 runs rush hours only and goes to the College of Staten Island, serving the neighborhoods near the Staten Island Expressway and Victory Boulevard. From Bayonne, you can take the S89 Limited bus during rush hours from the 34th Street Hudson-Bergen Light Rail station. This bus runs down Richmond Avenue and serves sections of the North Shore, Mid-Island, and South Shore. A Staten Island Railway train. The Staten Island Railway is a hybrid of a railroad and a subway line. Fares are the same as a subway ride ($2.75), and it runs 24 hours, at intervals from 15 minutes during weekdays to hourly overnight, synchronized to the ferry schedule. Fares are collected only at St. George Ferry Terminal and Tompkinsville, and include a free transfer to or from the buses or subway in Manhattan. During rush hours, express service is provided and the locals terminate at Great Kills. The local buses run routes all over Staten Island and are distinguished by the S before the route number (ex. S55, S78). They have uncomfortable plastic seats and cost $2.50. During rush hours, some buses run Limited and stop at major cross streets and transfer points. For example, the S62 starts at Jewett Avenue, making all stops east, while the S92 makes all stops west of Jewett Avenue that the S62 normally makes, while stopping only at major streets like Clove Road east of Jewett Avenue. Limited route numbers are always in the 80s and 90s, and the numbers of the local and limited routes usually correspond (S62/S92, S46/S96). However, other routes on Staten Island that do not depart from the Staten Island Ferry Terminal do not necessarily follow the same rule. These are the S53, S54, S55, S56, S57, S59, S79, S89, and S93. The express buses are distinguished by the X in the coded display on the front of the bus (ex. X1, X17). These buses run from Staten Island to Manhattan, have more comfortable cloth seats, and cost $6. Most bus routes on the island meet up at the St. George Ferry Terminal. Other major transfer points include Port Richmond, with some buses terminating at Richmond Terrace at Port Richmond Avenue; the Staten Island Mall; and the Eltingville Transit Center on the South Shore. Fares can be paid in quarters or dollar coins (if you can find them). You can also use a MetroCard (good for all public transportation in NYC), available at some delis or at the machines at the ferry terminal. Buses run close to schedule, but service on Staten Island is sparse outside of rush hours, and even during peak hours, the most frequent headway is 10 minutes. Because of this, it helps to be prepared: either pick up a schedule for routes that you'll plan to take, check the Guide-A-Ride boxes at bus stops for exact times or use the MTA's BusTime system to track buses. A Staten Island bus map is available on this page. As the official "Borough of Parks", Staten Island has a large collection of parks. They range from modest playgrounds to immense expanses of raw nature. All parks operated by the New York City Department of Parks & Recreation are open 6AM–1AM, but the Greenbelt is operated by the Greenbelt Conservancy and Gateway is operated by the National Park Service. Parks affiliated with schools are the only exception. These are open from dawn to dusk, and it is generally considered good etiquette to stay out of the park if schoolchildren are playing in it. 40.5646-74.13111 Amundsen Circle, Amboy Road & Riedel Avenue (S57 to Amboy Road & Guyon Avenue, then walk two blocks south down Amboy Road). A small park that is not much more than a clearing and some trees. A monument to the man the park was named for, Roald Amundsen, stands in the center of it. 40.5314-74.17462 Blue Heron Park, Poillon Avenue & Amboy Road (No public transportation. Entrance for cars is on Poillon Avenue.). A large park on the South Shore known from its large collection of wildlife, from birds to wildflowers. True to its name, the park is a known habitat for blue herons. 40.560556-74.1236113 Clawson Playground, Adelaide Avenue & Emilra Street (S57 to Guyon Avenue & Whitehall Street, then walk east down Guyon Avenue and make a right onto Elmira Street). Open between dawn and dusk, except for school hours. This deceivingly small park has two large asphalt playgrounds, two smaller ones, a grass field, a baseball field, basketball courts, and a jungle gym. It is always peaceful and rarely crowded, as it is shared by Public School 50 during school hours. 40.581-74.18924 Freshkills Park, Wild Avenue & Pearson Street (S62/92 to Victory Boulevard & Wild Avenue, then walk 1 block east down Wild Avenue). Only in the first stages of development, this mega-park is set to be 2,200 acres—three times the size of Central Park. It will cover the wild areas of the Fresh Kills, as well as what was formerly the Fresh Kills Dump. The first section of the park, Schmul Park, in Travis, features a large and colorful playground for kids, along with basketball courts, handball courts, and an open grass field. 40.605278-74.0541675 Fort Wadsworth (S51/81 to any one of the seven stops inside the park.). 6AM-8PM. Dating back to 1663, this fort was used during both the American Revolution and the War of 1812. It remained active until 1995. It is now semi-active, with its main use being local headquarters for the United States Coast Guard. Tours are available. 40.564167-74.0955566 Miller Field (S76/86 to New Dorp Lane & Cedar Grove Avenue). 6AM-8PM. This park was operated as a United States Army airfield from 1919-1969. Now, it is a large, mostly grass park with baseball fields, soccer fields, and a children's playground. 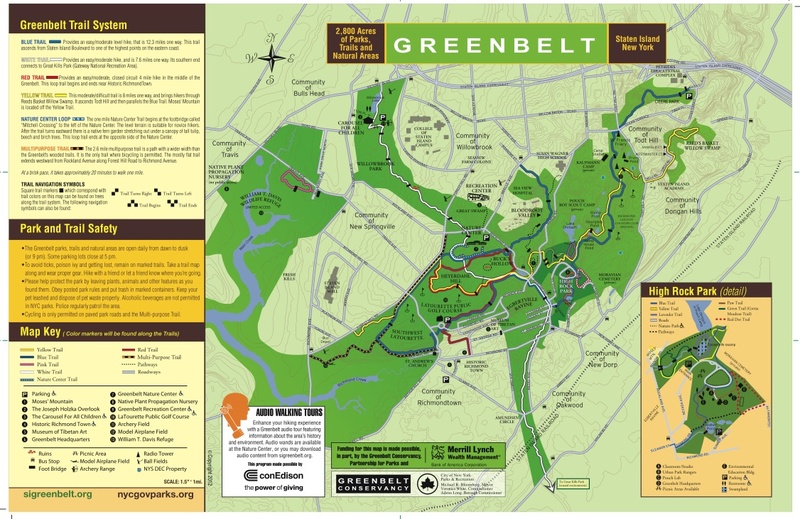 40.5444-74.1257 Great Kills Park (S78 or S79 to Great Kills Park). 6AM-8PM. This park is home to a large woodland and a number of beaches. A small portion of the beach is closed for radiation screenings. 40.515556-74.2002789 Lemon Creek Park, Hylan Boulevard & Sharrott Avenue (S59 or S78 to Hylan Boulevard and Sharrott Avenue), ☎ +1 718 667-6042. This park is home to the creek that shares its name, as well as a variety of wildlife. One of the most notable is the purple martin. The park has one of the very few colonies in the New York Metro. 40.5078-74.217510 Mount Loretto Unique Area. Nature preserve on the South Shore with hiking trails and shoreline access. Fishing is permitted along the beach or the freshwater pond inside the area. Most of the land is minimally developed, and is an excellent place to observe wildlife. An abandoned orphanage on-site, after which the area was named, burnt down in 2000. 40.579722-74.07583311 South Beach & Boardwalk (S51/81 to any stop along Father Cappodano Blvd.). This beach is a pleasant place to relax. The water is safe enough to swim in, but it's not the best you can get (you'd get a better deal down the Jersey Shore or on Long Island). The boardwalk, one of the longest in the United States, is great for running or biking. A view of South Beach, with the Verrazano-Narrows Bridge in the background. 40.6075-74.05916712 Von Briesen Park. The former estate of Arthur Von Briesen is now a small, hilly park. 40.6025-74.157813 Willowbrook Park, Eton Place at Richmond Avenue or Victory Boulevard at Morani Street (S62/S92 to Morani Street, S44/S94 to Eton Place). A large park with a carousel. 40.5217-74.193114 Wolfe's Pond Park (Take the S78 bus (ramp A) to Seguine Avenue). The Conference House at 298 Satterlee St., near the southern tip of Staten Island. 40.614917-74.06361115 Alice Austen House, 2 Hylan Blvd (take the S51/S81 from bus ramp D of the ferry terminal to Hylan Boulevard). 40.502861-74.25377816 Conference House, 298 Satterlee St (take the S78 (Ramp A) to Hylan Boulevard at Craig Avenue, then walk 1 block south), ☎ +1 718 984-6046. Dates back to 1680, and held an abortive peace conference during the Revolutionary War. 40.5713-74.145817 Historic Richmond Town, Richmond Road & Arthur Kill Road (S74/84 to Richmond Road & St. Patrick's Place). 40.576314-74.13834718 Jacques Marchais Museum of Tibetan Art, 338 Lighthouse Ave (S74 to Richmond Road & Lighthouse Avenue, then walk a few blocks north up Lighthouse Avenue), ☎ +1 718 987-3500. W–Su 1PM–5PM. American woman Jacques Marchais had a dream of traveling to Tibet. While she never made it, her extensive collection of Tibetan artifacts was made into a museum in 1947. The museum now holds over 120 pieces of beautiful Tibetan art. The museum's authenticity was praised by the Dalai Lama. Free. 40.6411-74.103119 Staten Island Children's Museum, 1000 Richmond Terrace (Snug Harbor) (S40 or S44 bus (Ramp D)). 40.644361-74.07777820 Staten Island Museum, 1000 Richmond Terrace, Building A (A short walk from the ferry terminal), ☎ +1 718 727 1135. W-Su 11AM-5PM. Adults $8, students and seniors $5, children 2-12 $2. 40.64071-74.0749921 National Lighthouse Museum, 200 The Promenade (At Lighthouse Point), ☎ +1 718-390-0040. 40.6467-74.076422 Postcards (Walk a few blocks from St. George Ferry Terminal). Staten Island's September 11th memorial honors all of its residents that lost their lives on Sep 11, 2001. 40.643189-74.1023523 Snug Harbor Cultural Center (Snug Harbor) (Take the S40 or S44 buses from the ferry (bus ramp D)). This is the largest collection of Greek revival, temple style buildings in America. A true architectural gem featuring the Staten Island Botanic Garden, which features an authentic Chinese Scholar's garden (created by actual Chinese scholars!). There is also an art museum, the John A. Noble Collection, on the grounds. This is one of the most beautiful places in New York, a place even the most jaded New Yorker will marvel at. Staten Island Yankees, at the Richmond County Bank Ballpark at 75 Richmond Terrace (within walking distance of the St. George Ferry Terminal), ☎ +1 718 720-9265, fax: +1 718 273-5763, e-mail: siyanks@siyanks.com. Go to a game of this A-class Minor League Baseball team, an affiliate of the New York Yankees. Come for a relaxed, fun time, away from the smothering hustle and bustle of the major leagues. 40.6251-74.11571 Staten Island Zoo, 614 Broadway (S48/98 or S53). It's in West New Brighton, and is a fun destination for younger children as well as animal enthusiasts. The zoo used to have the most snake species of any zoo in the world. It no longer holds that title, but still has a substantial reptile wing. The New York Public Library, Various locations. Come and visit one of the largest public library collections in the world. Just sit down with one of the millions of good books and relax. You can also use a computer or take books outside of the library, although you first must register for one of the library's famous red and blue cards. For the history buff in you, every Staten Island branch has a file cabinet marked Staten Island Local History with fascinating documents relating to Staten Island's history. A list of Staten Island locations can be found below. Free. United Artists Theater, 2474 Forest Ave (S40/S90). The biggest movie theater on the island is a great place to relax and watch a flick. Atrium Stadium Theaters, 680 Arthur Kill Rd (S74/84 to Arthur Kill Road at Cortelyou Avenue), ☎ +1 718 984-7600. Another large movie theater, the Atrium is also great for taking in a movie. 40.581667-74.1655561 Staten Island Mall, 2655 Richmond Ave (S44/94, S59, S61/91, or S79 to stops labeled Staten Island Mall), ☎ +1 718 761-6800. M-Sa 10AM–9PM, Su 11AM–6PM. The Staten Island Mall is the largest mall in New York City and the center of retail life in Staten Island. There are three anchor stores: Macy's, JCPenney, and Sears. There is also a large food court and a variety of smaller stores. In the vicinity, there are a number of sizable shopping centers. Bricktown Mall, 2700-2900 Veterans Road West (S74/84 or S78 to Bricktown Mall terminus; From Korean War Veterans Parkway follow "Charleston Shopping Center" signs). Taking up 400,000 square feet, this mall houses a small number of large stores. 40.5667-74.11332 Hylan Plaza, 2630-2670 Hylan Blvd (S78 or S79 to Hylan Boulevard & Beach Avenue). A smaller shopping center, Hylan Plaza is still home to a number of retail stores alongside numerous mom-and-pop shops. It's located along a line of smaller shopping centers. A shopping area clearly influenced by Staten Island's location in New York City is New Dorp Lane, located in, you guessed it, New Dorp. New Dorp Lane has the feel of a commercial street in Brooklyn or parts of Manhattan; however, it is far less busy than either of the two. You can walk down one of the wide sidewalks and pass a variety of small businesses. The New Dorp Lane commercial district is best experienced by walking, as New Dorp Lane is notorious for frustratingly bad traffic. Saint George Greenmarket, Hyatt Street and St. Marks Place (S42/52 to St. Marks Place & Hyatt Street). Sa 8AM–2PM. Staten Island Mall Greenmarket, Staten Island Mall main parking lot (S44/94, S59, S61/91, or S79 to stops labeled Staten Island Mall). Sa 8AM–3PM. Heritage Farm, 1000 Richmond Terrace (S40/90 to Sailor's Snug Harbor Gate). Sa noon–5PM. This market sells products only grown on-site. While the vast majority of Staten Island eateries are Italian, there are some gems of ethnic cuisine in the St. George and Tompkinsville neighborhoods. Mostly within a mile of each other on Victory Blvd (and in walking distance from the ferry terminal), the authentic and inexpensive restaurants serve up flavorful South Asian cuisine well worth the trip. 120 Bay Cafe (formerly Cargo Cafe), 120 Bay St, ☎ +1 718 273-7770. Laid back eatery. Cool decor. Excellent appetizers and burgers. Great beers on tap. Entertainment weekly! Denino's Pizzeria & Tavern, 524 Port Richmond Ave, ☎ +1 718 442-9401. It is reasonably priced and has tasty dishes besides pizza. Gennaro's, 413 New Dorp Ln (S76/86 to Hylan Boulevard), ☎ +1 718 979-2382. Su–Th 11AM-10PM; F Sa 11AM-1AM. While it is overshadowed by the hordes of fancier pizza parlors on the island, Gennaro's is perfect if you're looking for a cheap slice the whole family can enjoy. Goodfella's, 1817 Victory Blvd (S61/S91 S62/S92 S66 from Bus Ramp A to Manor Road, X12/X42 express buses from Manhattan to Manor Road, S93 bus from Bay Ridge to Manor Road). Famous for their vodka pizza, the recipient of several awards. Joe And Pat's, 1758 Victory Blvd (S61/S91 S62/S92 S66 from Bus Ramp A to Manor Road, X12/X42 express buses from Manhattan to Manor Road, S93 bus from Bay Ridge to Manor Road), ☎ +1 718 981-0887. Specializes in an extraordinarily thin pizza that is one of the best slices in the city. Uniquely thin without too much cheese, Joe and Pat's slices are some of the lightest in the city. Try the eggplant fries. Pizzeria Giove, 278 New Dorp Ln (S76/86 to Clawson Avenue), ☎ +1 347 286-0635. M Tu 10:30AM-10:30PM, W 10:30AM-10:30PM, Th 10:30AM-10:30PM, F 10:30AM-11:30PM, Sa 10:30AM-11:30PM, Su noon-10:30PM. A small pizzeria known for its authentically Italian thin crust pizza. Unlike New York pizza, it is cooked in a wood-fired oven. It has been featured on the TV show Throwdown with Bobby Flay. Ralph's Itailan Ices, 501 Port Richmond Ave (S44/94 or S59 to Walker Street). The original store of the successful chain of stores serving light, refreshing ices. The chain has numerous other locations in the New York Metro, including a handful in other Staten Island neighborhoods. They are in New Dorp, Great Kills, Eltingville, Huguenot, and Pleasant Plains. The full list can be found here. Bay House Bistro, 574 Bay St (Staten Island Railway to Stapleton, S51 or S76 bus to Prospect Street (bus ramp B)). One of the best Asian take outs going. Focus on the appetizers, heavily influenced by Southeast Asian cuisine, particularly Malaysian. Try the roti canai or the curry veggie pies. Taqueria Gallo Azteca, 75 Victory Blvd, ☎ +1 718 273-6404. The cemitas are to die for, a sandwich with your choice of meat, with avocado, chipotle peppers, quesillo, and beans. One of the best sandwiches you'll ever have. Burrito Bar, 585 Forest Ave (S48 to Pelton Ave Stop), ☎ +1 718 815-9200. Fun Tex-Mex restaurant with generous portions, bar is on the lower level, and restaurant is upstairs. Beso, 11 Schuyler St (Leave the ferry terminal, cross the street, make a right, left on Schuyler). Spanish restaurant with live music occasionally. Tapas and sangria bring some much needed class to the neighborhood. A short walk from the ferry and a great place to eat. Real Madrid, 2073 Forest Ave (S48/S98 to Union Avenue (Bus Ramp B), X12/X42 or X30 express buses from Manhattan to Union Avenue), ☎ +1 718 447-7885. A restaurant with authentic Spanish food. Lakruwana, 226 Bay St. One of the more elegant eateries. Its fine decor and delicious meals belie the outrageously inexpensive prices. Sundays offer a lunch and dinner buffet. New Asha Restaurant, 322 Victory Blvd (next door to Lakruwana). Offers many of the same items at competitive prices. Has been named #1 by the Village Voice Cheap Eats in the past. Featured on Anthony Bourdain's No Reservations. Try a mutton roll! There are several Sri Lankan groceries that dot the street on the 15-20 minute walk from the ferry. St. George has a few bars located south of the ferry terminal. Make a left when you leave the boat. Look for live music at the Cargo Cafe or Karl's Klipper, both located on Bay Street with phenomenal views of the Verrazano Bridge. Nurnberger Bierhaus, 817 Castleton Ave (S46 to Davis Avenue (Bus Ramp B)). Offers a wide variety of imported German beers and well-prepared, authentic German food. There is an outside beer garden that offers a limited menu, open in seasonable weather. Beers are served in liter steins and the food is as good as any you will find in Germany. There is beer on the Staten Island Ferry. It is cheap (by NYC standards). A 16-ounce can of Bud or Miller will cost $3.50. Staten Island is the closest borough to New Jersey's Newark International Airport. This results in lower taxi fares and shorter travel times as opposed to Manhattan (the taxi fare is $45 to any point in Staten Island plus up to $10 in tolls). You may want to consider sleeping in a hotel here for this reason. Hilton Garden Inn, 1100 South Ave (S46/96 to South Avenue & Lois Lane). Holiday Inn Express, 300 Wild Ave (Take the Staten Island Expressway to the West Shore Expressway (Exit 5). Get off at Victory Blvd (Exit 7)), ☎ +1 718 276-8689. Check-in: 4PM, check-out: 11AM. When discussing crime in Staten Island, it first must be established that Staten Island is not a crime-ridden mob haven, as it is portrayed in movies and reality TV. Staten Island is no more dangerous than any of the other boroughs of New York City. However, it does have some crime. The northern and southern portions of Staten Island are pretty different in the amount of crime and the type of crime found there. The North Shore has a somewhat elevated crime rate compared to the rest of the Island. It is home to large low-income housing projects. This attracts a lot of both petty crime and more serious crimes. Be careful when walking alone at night. Once you get below the Staten Island Expressway, however, the situation changes. The South Shore has a relatively low crime rate. Residents often joke about it, saying that the local burglars are nice enough to wait until your car is unlocked to rob it. Travelers to the South Shore with seasonal allergies may be better-advised to worry about high pollen counts during the spring. There are dozens of trees on most South Shore streets (so many you may not believe you're still in New York City). If you have severe allergies, consider addressing the problem before coming to Staten Island in April or May. St. George Branch, 5 Central Ave (S42 or S52 to Central Avenue and Hyatt Street. ), ☎ +1 718 442-8560. M-Th 8AM–8PM, F Sa 10AM–5PM. Stapleton Branch, 132 Canal St, ☎ +1 718 727-0427. M W-Th 10AM–6AM, Tu noon–8PM, F Sa 10AM–5PM. West New Brighton Branch, 976 Castleton Ave, ☎ +1 718 442-1416. M Tu Th 11AM–6PM, W noon–8PM, F Sa 10PM–5PM. Port Richmond Branch, 75 Bennett St, ☎ +1 718 442-0158. M-W 10AM–6PM, The noon–8PM, F Sa 10PM–5PM. Todt Hill–Westerleigh Branch, 2550 Victory Blvd, ☎ +1 718 494-1642. M W Th 10AM–6PM, Tu noon–8PM, F Sa 10PM–5PM, Su 1PM–5PM. The only Staten Island branch open on Sundays. South Beach Branch, 21-25 Robin Rd, ☎ +1 718 816-5834. M-W 11AM–6PM, Th noon–7PM, F Sa 10AM–5PM. Dongan Hills Branch, 1617 Richmond Rd (S74/84 or S76/86 to Richmond Road and Four Corners Road/Seaview Avenue), ☎ +1 718 351-1444. M W noon–7PM, Tu Th 11AM–6PM, F Sa 10AM–5PM. New Dorp Branch, 309 New Dorp Ln (S76/86 to New Dorp Lane and Clawson Avenue), ☎ +1 718 351-2977. M W 10AM–6PM, Th noon–8PM, F Sa 10AM–5PM. Richmondtown Branch, 200 Clarke Ave, ☎ +1 718 668-0413. M noon–8PM, Tu-Th 10AM–6PM, F Sa 10PM–5PM. Great Kills Branch, 56 Giffords Ln (SIR to Great Kills, then walk two blocks north to Margaret Street), ☎ +1 718 984-6670. M Th 11AM–6PM, Tu W noon–7PM, F Sa 10AM–5PM. Huguenot Park Branch, 830 Huguenot Ave, ☎ +1 718 984-4636. M-W 11AM–6PM, Tu 10AM–6PM, Th noon–8PM, F Sa 10AM–5PM. Tottenville Branch, 7430 Amboy Rd, ☎ +1 718 984-0945. M noon–8PM, Tu-Th 11AM–6PM, F Sa 10AM–5PM. Let's be honest: the majority of travellers don't travel great distances to go to Staten Island (good for you if you do, but you're in the minority). While the Island is a hidden gem, many of the main tourist attractions are around it, and you will want to check them out. The first order of business is to make sure you've gone completely through New York City. Each of the four other boroughs (Manhattan, Brooklyn, Queens, and the Bronx) have their own attractions and features you'll want to see. Nearby towns – If you just want to relax after the hustle and bustle of New York City, you can visit Bayonne to the north, Elizabeth to the northwest, Linden to the west, or Perth Amboy to the southwest. Jackson – Further south than Perth Amboy, Jackson is home to one main attraction: Six Flags Great Adventure. This amusement park is the biggest theme park in the Northeastern United States. It is also home to a safari park and a water park (Hurricane Harbor). Its biggest attraction, however, is Kingda Ka, which is the world's tallest roller coaster at 456 feet above the earth. Sandy Hook – This narrow strip of land of the coast of New Jersey is home to the Sandy Hook Unit of the Gateway National Recreation Area. The Jersey Shore – The ultimate destination for summer fun in the Mid-Atlantic is right near New York City. Atlantic City – The gambling capital of the Eastern U.S. is also home to a popular beach & boardwalk. Philadelphia, Pennsylvania – If need be, you can always skip New Jersey and go straight on to the City of Brotherly Love. This city travel guide to Staten Island has guide status. It has a variety of good, quality information including hotels, restaurants, attractions and travel details. Please contribute and help us make it a star!